Knights of the Frozen Throne: King Mosh is finally good! King Mosh is the Warrior class legendary minion from Hearthstone’s Journey to Un’Goro expansion, and I had high hopes that it would help Control Warrior return to viability in that expansion. Alas, that was not to be, even though King Mosh had its occasional moments already back then. However, with Knights of the Frozen Throne, King Mosh is back with a vengeance! King Mosh is a nine-mana 9/7 Beast minion with a Battlecry to destroy all damaged minions. Effectively, it acts as a board clear (together with some damage-dealing capabilities) and a tempo swing – much like Deathwing but depending on a two-card combo instead of discarding your entire hand. When it was released, the only real combo potential it had was with Whirlwind – a card that had not seen play in Control Warrior builds because Revenge was far better suited for their game plan. 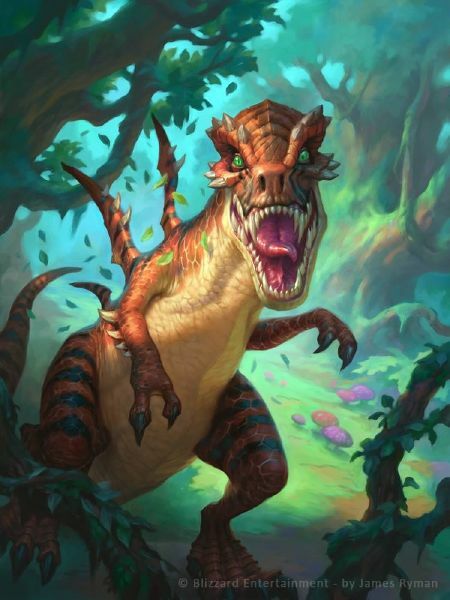 Nonetheless, Whirlwind did rise to prominence in Journey to Un’Goro as a replacement to Revenge, which rotated out of the Standard format. Whirlwind was always a sub-par card for Control Warrior, far better suited for more tempo-oriented builds, but lack of alternatives forced the hand of Control Warrior players to include it. 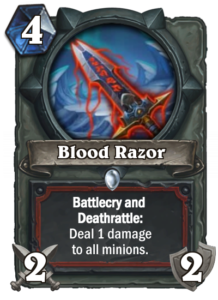 With Knights of the Frozen Throne, a worthy replacement has finally arrived: Blood Razor, a four-mana 2/2 weapon with both a Battlecry and a Deathrattle to deal one damage to all minions. In practice, holding on to the second charge of Blood Razor enables the Warrior to reliably activate King Mosh as a full board clear already on Turn nine, in practice often a bit later than that. Blood Razor also has another advantage: it can help King Mosh get rid of a minion with Divine Shield. By attacking into the minion, you can remove the Divine Shield, and the area-of-effect damage comes in afterwards dealing one damage to the minion, preparing it to be King Moshed. King Mosh does not have to be used as a full board clear, though. You can also look for smart trades, controlling which minions are damaged and which ones are not, and use King Mosh as an Execute on a stick. Nonetheless, it takes both this use case and the potential for a full board clear to really make King Mosh worthwhile. Thanks to Blood Razor, King Mosh is finally fully viable in Control Warrior. During Journey to Un’Goro, King Mosh was more often seen in Tempo Warrior – and even Tempo Warrior was a rare sight. It remains an excellent fit, as Blood Razor is also a great card for Tempo Warrior and thus Tempo Warrior has all of the toolkit a Control Warrior has to make use of King Mosh. In fact, Tempo Warrior has an even better toolkit thanks to Blood to Ichor and possible Whirlwind. King Mosh can serve as a comeback mechanic for Tempo Warrior, a tool to enable one final push, or it can serve as an Execute on a stick to get through one final Taunt minion in a push for lethal. The King is here! 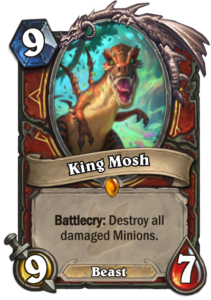 King Mosh was almost good enough in Journey to Un’Goro, and the introduction of Blood Razor has now made it a great card as it finally has enough synergy cards to be used effectively in both Control Warrior and Tempo Warrior. Next Next post: Ultimate Infestation Jade Druid has a weakness!